Book Review Brassaï: Paris Nocturne By Sylvie Aubenas & Quentin Bajac Reviewed by Blake Andrews Brassaï's Paris. Few photographers are so closely associated with such a specific place and mood. The dark couplings, calm vice, and extravagant Parisian nightlife of his photographs immediately identify themselves as his, but it's a bit hard to put ones finger on why. Paris at night? Could any subject be more cliche? But Brassaï's images set themselves apart. He shot "the slimy joints of Paris" in Henry Miller's words, but with a glow that was ineffable. Brassaï: Paris Nocturne. By Sylvie Aubenas & Quentin Bajac. By Sylvie Aubenas & Quentin Bajac. Thames & Hudson, 2013. Hardbound. 296 pp., 214 duotone illustrations, 9-3/4x12". Brassaï's Paris. Few photographers are so closely associated with such a specific place and mood. The dark couplings, calm vice, and extravagant Parisian nightlife of his photographs immediately identify themselves as his, but it's a bit hard to put ones finger on why. Paris at night? Could any subject be more cliche? But Brassaï's images set themselves apart. He shot "the slimy joints of Paris" in Henry Miller's words, but with a glow that was ineffable. Brassaï's identity is now so engrained in photographic history that it's easy to overlook its chance roots. When he moved to Paris in 1924, Gyula Halász was a young artist with strong creative urges but not much direction. Making his way as a writer and designer, he adopted the name Brassaï, and gradually stumbled into photography. By then he was 30. The Great Depression was beginning its global constriction. Brassaï found himself enamored by the local nightlife. After two years of heavy shooting he was confident he had enough for a book. Brassaï: Paris Nocturne, by Sylvie Aubenas & Quentin Bajac. Published by Thames & Hudson, 2013. Published in 1932, Paris de Nuit was an instant sensation, selling out multiple editions and establishing Brassaï's name not only in France, but also internationally. Within less time than it took to smoke a cigarette, he was a star. Looking back 80 years later, perhaps a more accurate description is one hit wonder. Brassaï went on to shoot other subjects and assignments after Paris de Nuit but never with the same intensity and verve. Nothing he shot after 1934 is much remembered. He published later books but not based on new photography. They were instead reformulations of his Paris work. In other words, the bulk of his legacy rests on a brief 4-year period shortly after he'd taken up photography. Instagrammers take note. It's a brief legacy but a rich one. 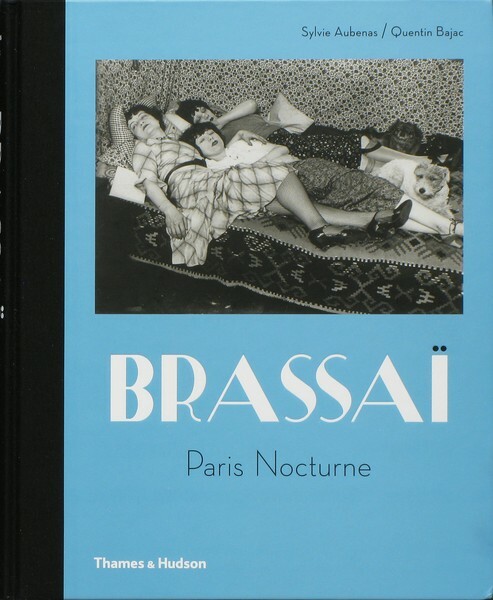 Brassaï: Paris Nocturne finds plenty of material, enough for a nice thick volume. Pulling chiefly from Paris de Nuit and the later Secret Paris of the '30s (Brassaï's first and last books) co-authors Sylvie Abenas and Quentin Bajac examine Brassaï's early career and achievements from a variety of perspectives. The original Paris photographs are the main highlights, but the book is full of interesting ephemera including scrapbook clippings, mockups, magazine spreads, and other archival material. Tying it all together are three great essays on Brassaï.